After spending a nice spring day strolling around the borough of Queens, I arrived at LaGuardia Airport. I walked to the airport from the Woodside train station, and really got to see the real NYC. Spirit flies out of Courcourse B in Terminal B. I had heard that this is an unholy combination, and it is. Sprit shares this concourse with AirTran, Southwest and Frontier. It was a busy, busy place with a lot of stressed out leisure travelers. I ate a mediocre sandwich in the Frontier waiting area, as the Spirit waiting area was very crowded. There were some delays on the Spirit flight to Dallas, but Southwest was a good neighbour, and Spirit could use one of their jetbridges. When boarding time approached for the flight to Detroit, I found a comfy spot to sit with my coffee and took in the crowd. It looked like it would be a pretty full flight. The Tigers were playing the Yankees that weekend, and a lot of the people on the flight enjoyed the series. I’d say the average age on the flight was 27. As I was waiting for boarding, I was listening in on a delightful conversation between some ladies visiting NYC from South Carolina chatting with Spirit ground staff. I must say, Spirit has some excellent staff at LGA. They were very professional with situations such as paying for carry-on bags, and helping customers that missed their flight because they thought they only needed to show up at the gate at the departure time… Boarding started earlier than I expected, and was handled very efficiently. 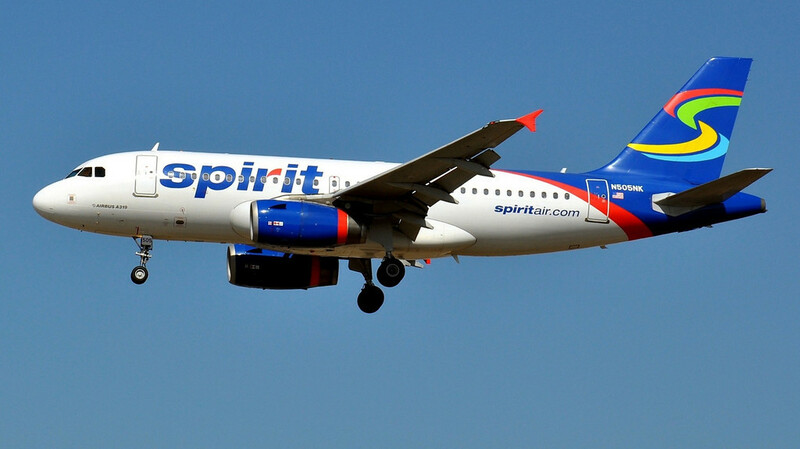 Spirit gets a bad rap for charging for carry-on, but most people knew what was up. I think only two people were stopped at the gate to pay. I used a small carry-on, which NK allows for free. We departed on time, and with minimal taxiing, and a reasonable wait for take-off made our way to the Motor City. On board, I quickly realized that I had made a mistake. I was going to pick up a newspaper or a magazine for the flight, but thought, nah – I’ll read the in flight magazine. I didn’t know there was no magazine on board. Even RyanAir has a magazine! Anyway, the cabin crew was robotically efficient. I bought a bottle of water on board and relaxed. The guys behind me had just reached legal age, and I did enjoy listening to their breakdown of their weekend in Brooklyn. Leg room was a bit tight, and since I am only 5’9, I imagine that anyone over 6’0 would be in agony. The flight was smooth, and took more-or-less the same route as gcmap.com suggests it would. We landed a few minutes early, and it was only about 10 minutes between deplaning at the McNamera Terminal at DTW to getting in my car parked on the Big Blue Deck. Reasonable expectations are important when flying on a ULCC. You won’t get a free drink, but the Buy on Board pricing is the same for drinks as in the terminal. You won’t get much legroom. You will get a nice price, your flight will be operated as safely as any other American carrier, and if you know what’s up, you’ll be happy with your experience. It ain’t Emirates. I am looking forward to my next NK flight. I am on the inaugural BWI-DFW flight on September 6, 2012. My ticket had a jaw-droppingly good price, and I am rather excited to take my first Inaugural flight. Thank you for sharing your blog about Spirit Airlines . It is very informative and interesting. Just keep on sharing. Sіmplу wаnt to saу your articlе is аs astonіshing. Check DTW Airport Taxi Service. Expansion plans by authorities would work in this regard so passe can solely enjoy their travel. In this stance i am just ready to go for gatwick airport parking this time. Attain the reliable services of meet and greet parking gatwick north and be happy that nothing will bother you in your travels. Stunning!. thanks for sharing such a nice and informative blog, travelers always remember their long journey full of beautiful memories and valet parking gatwick is fulfilling their expectations on high priority.